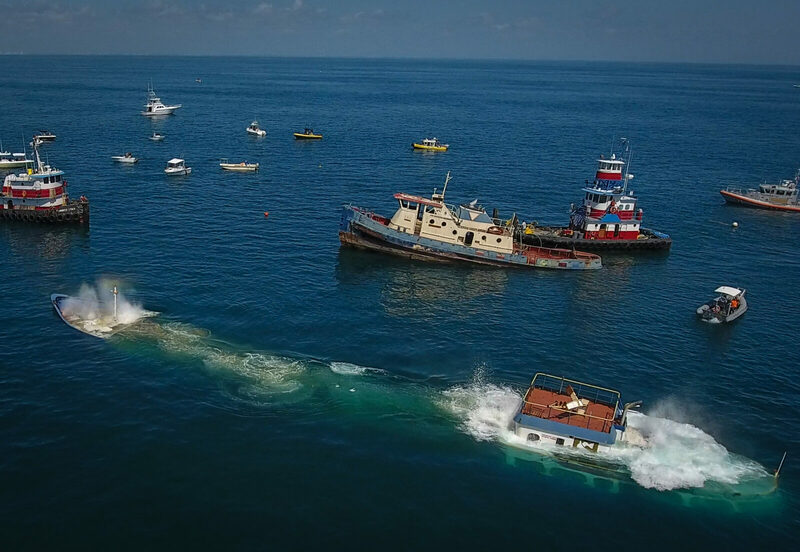 June 27, 2018 – On Saturday, June 23, 2018, the Lady Philomena, a 150-foot steel vessel was deployed in 80 feet of water at artificial reef site 12, roughly nine miles offshore the Ponce de Leon Inlet. This project was made possible through the funding partnerships of Volusia County, Coastal Conservation Association Florida (CCA Florida) and CCA’s National Habitat Program, the Building Conservation Trust (BCT). BCT received a grant from the FishAmerica Foundation, the conservation funding arm of the American Sportfishing Association, and the Brunswick Public Foundation, which helped ensure the project’s success. The 90-foot Tug Everglades was also placed alongside the Lady Philomena during last week’s deployment. The vessels are intact and upright on the seabed in very close proximity to one another and will make excellent fishing and diving sites. The Lady Philomena was forfeited to the U.S. Customs in Miami, after having been seized with contraband. The vessel was deployed in an established artificial reef system consisting of clean concrete culverts, structures and large concrete bridge components. The deployment of the Lady Philomena will enhance this underwater community, attracting marine life such as fish, shrimp and crabs. Artificial reefs also boost local economies through an increase in sport fishing, tourism and patronage in small businesses. The Volusia County artificial reef system is visited by an estimated 50,000 vessels annually and experiences high visitation by recreational anglers and divers. The reef started generating local excitement last fall, when Volusia County hosted a two-day viewing party that enabled visitors the opportunity to tour the ship.